It’s really hard to think when there’s this awful, nauseating realization that you may be lost in the wilderness and you start to panic. Suppose you have a map and compass along, and a basic idea of how to use them. But maybe you didn’t think about using them…Now what? After all, the sun was out, the day was nice, the trail is clear, the scenery beautiful and you did take a map and compass along. But it’s in the pack somewhere, and hard to get to, so you didn’t check it. And, the point was to get out in the woods and relax, and who can unwind when you have to fool around with land navigation stuff? Besides, you’re well prepared, with survival knife, a survival kit, tarp and…all that gear. And! You have a GPS. But then darkness starts to fall, the weather changes, and it’s hard to remember which of the forks in the trail you took. And for some reason – the GPS quit working. Maybe the batteries are dead. The day may start out nice, but suddenly bad weather threatens. And – you don’t know where you are. At this point, many people will panic. When that happens, you can’t think or reason. But in this situation, remembering some common sense land navigation memory aides and acronyms will help calm you down. Once you can correctly orient the map, you can figure out where you are and where to go. You can also decide if the smart option is to set up a shelter, build a fire and stay put while waiting to be rescued. Don’t try to make this kind of decision when you can’t think! Humans are hard-wired to want an activity pattern. Creating a routine to fall back upon in this situation could help calm you down. It will hasten your ability to make good decisions. Here’s a survival mindset exercise that uses simple, easy-to-remember map and compass memory aides. Memorize them, and the order they’re in, and you’ll have one more tool in your survival kit. 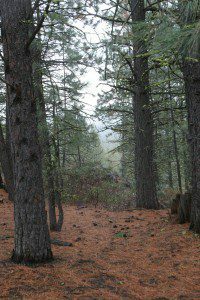 STOP: First and foremost, in any wilderness emergency is the need to focus on the situation. Stop (sit down while you’re doing this part), Think, Observe and Plan. Stay seated until you reach “P” and don’t get up until you have a plan. Then, get out the map and compass. Red=N: Which end of the needle is north? Maybe you want to write this on the compass somewhere: Red = North. These are basic navigation tools: compass, emergency whistle, map and GPS. Start with the basics: Does the red end of the compass needle point north? Yeah – this is elementary stuff, but really important. Disorientation is a symptom of dehydration, fatigue, hypothermia and panic, and you can have all these problems at once. And maybe you also have to deal with pain, because of an injury. The other instance wasn’t funny, and could have lead to tragedy. I happened across a compass, with a red needle that pointed south, on the shelf of a local sporting goods store. An unsuspecting customer could have bought the compass, assumed the red needle pointed north and gotten really, really lost. The salesman was appalled, and checked out all the rest of the compass inventory on the spot. Never, ever buy a compass that has anything whatsoever wrong with it! Red in the shed: OK – you remember, and are positive, that red is north. But, next, aren’t you supposed to do something with the pointy do-hickey in the bottom? It’s probably more dignified to say “Box the needle” or “Align the red, north-pointing needle with the orienting arrow figure on the bottom of the dial.” But you’ll remember “Red in the Shed,” because it rhymes and the alignment box resembles, with a little imagination, a tall, skinny shed. Two norths? There are two norths on a topographic map: Magnetic north and True North and the difference could confuse an exhausted, cold person. Magnetic north is where the needle points to the actual magnetic North Pole. In 2005, that was about 800 miles from the geographic north pole, near Ellef Ringes Island in the Canadian Arctic (Latitude: 82.7, Longitude: 114.4). True north is the direction to the top of your map. Since the earth is a pear-shaped object and a map is flat, inevitably, there will be some variations. So remember this acronym: MN to MN = Magnetic needle, magnetic north: The Magnetic needle on your compass points to magnetic north. MN-to-MN. True north is always and truly at the top of your map. But that’s not the only thing about true north and magnetic north you need to know. The difference in angle between true north and magnetic north is called declination, and you’ll have to adjust your compass and map. Which way to adjust for declination? How do you remember if you adjust for easterly or westerly declination? In the continental U.S. , just look at the Mississippi River. If you have to go east to get to it, then you adjust for easterly declination. If you have to go west, it is westerly declination. And, if you live in the zone along the big river, you probably don’t have to adjust for declination at all. Anyone venturing out into the wilderness needs to have a good working knowledge of a map and compass. Never rely on a GPS alone. Any electronic device can fail, and the best GPS in the world is only as good as its power source. These tips are a very small piece of staying found. A critical tool in your survival kit is knowledge and skill. 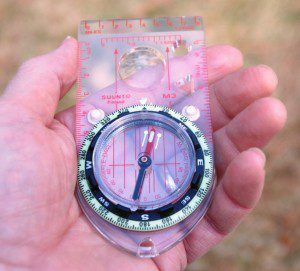 Invest the time and money to take a good land navigation class, then buy a quality compass. Another good idea is to make your own topographic maps, specific to the area you are going to. There are several mapping software programs on the market, and don’t forget google maps as a resource. Memorize these aids, and that potential panic attack will dissipate while you figure out where you are!